The Page is a rare and very special orange (it&apos;s actually a cross between a Honeybell and a tangerine) with a taste that&apos;s just out of this world. Once you try one, you&apos;ll understand why those in the know order these again and again. You really can&apos;t buy the Page in stores; it&apos;s a bit on the small size and hard to grow commercially. We sell them because our customers adore the intense flavor. These are littler guys, not big boys--more the size of a tangerine. They have a deep, reddish-orange peel. This is where the Page shines! The rich, sweet, full taste of a Page is not like a common, grocery-store citrus. Many say they&apos;re the best-tasting, most delicious oranges you can buy. Some people actually find them a bit addictive! You&apos;ll be amazed by how much juice is inside a Page. They make the best juice you&apos;ve ever had. Citrus lovers often prefer their fruit seedless so they can get to the sweet flesh that much faster. But with the Page, it&apos;s definitely worth the few moments it takes to get around a few seeds. The number will vary, by the way--some Pages may be seed-free, while others may have more than a few. The Page Orange is an amazing eating orange, even with the seeds. They&apos;re thin-skinned, but still pretty easy to peel. Just treat them gently and with care, because these sweet, juicy little critters are a bit delicate. Luckily for you, the Page Orange ripens early and has a long season--from November through February. The peel texture of the Page changes from rough to smooth, depending on growing conditions. 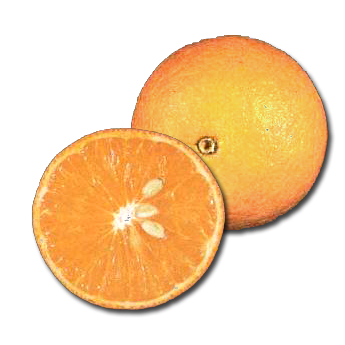 Pages are three-quarters tangerine and one-quarter pommelo, a type of grapefruit. The Page was developed by the USDA in the early 1940s. Although many recognized the great eating potential of this fruit, its smaller size and finicky growing habits have made it rare and hard to find. Take the opportunity to enjoy one of Florida&apos;s best-kept citrus secrets!